Couple of great charts this week from STA Wealth Management on the infamous birth/death model used as part of U.S. employment data. 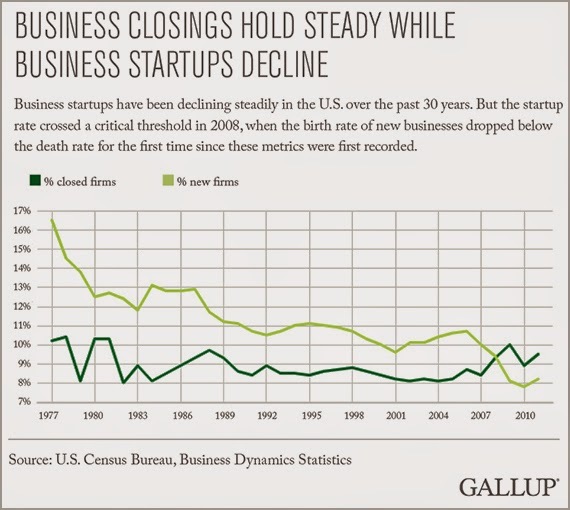 The first is the business openings vs. startups in the United States going back to 1977. As the chart describes, 2008 was the point when births dropped below deaths and it has remained that way since. 400,000 businesses are being born annually while 470,000 are dying. This goes counter to what the government has reported in the birth/death model where they essentially guess at how many jobs are being created due to new businesses being born. In the chart below you can see the government's employment growth (blue bars) against what the series would look like if the birth/death model was removed (black line). This is part of the troubling situation the Federal Reserve finds itself in. The "recovery" has been in asset prices not the real economy, and the unemployment rate sits at 5.8%. This is due in large part to the birth/death model described above, Americans taking lower paying jobs and/or reduced hours, and people dropping out of the labor force. Additionally, the Fed must weigh the impact of the oil price collapse on U.S. employment moving forward. That sector has been the lone bright spot in the American economy since 2007, not only due to job creation but higher paying job creation. For more see: Why Are Young Americans Not Starting Companies? "It is a day to take the measure of our infatuation with central banking." He goes on to discuss how this move will impact soaring real estate prices in Switzerland and the global bond bubble driven by central banks around the world. 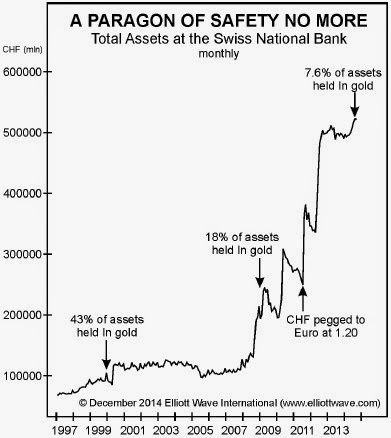 Incredibly, Grant actually explained why the Swiss would make this move in his September 2014 Interest Rate Observer. A Swiss citizen sitting down with his broker this morning after finding out his stock portfolio lost 15% overnight. 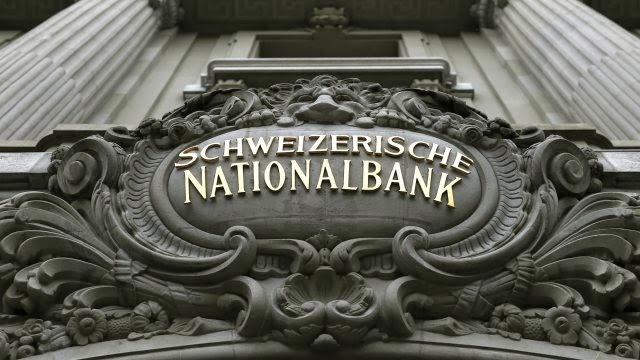 In September 2011, Switzerland's central bank announced they would defend their currency against the euro at $1.20. Money was flooding into Switzerland from Europe as many people felt banks would close or governments would default on debts (Greece, Italy, Spain). As money entered the country, euros were sold in exchange for Swiss francs, which caused the franc to rise violently against the euro. As we have seen throughout the currency wars over the past four years when your currency rises rapidly it causes problems for corporations within your country. Your exports are less competitive and business operations taking place outside your country experience lower profits or even losses. The floor at $1.20 meant whenever the value of the Swiss franc reached $1.20 against the euro, the Swiss central bank would enter the market and purchase euros (selling francs). This caused their balance sheet to mushroom in size as they have had to defend the peg continuously since the announcement in late 2011. Knowing the Swiss central bank stood ready to defend the currency at 1.20 allowed currency traders to put on massive (leveraged) stops on the Swiss/Euro currency pair at 1.20. Overnight, completely out of the blue while most of the world was sleeping, the Swiss central bank decided to remove the peg. Computer algorithms triggered massive buying orders on the news. This then instantly triggered the stops at the 1.20 line. The Swiss franc strengthened from 1.20 against the euro down to 0.75 in a matter of seconds. There is no historical comparison to this type of movement in the developed currency markets. The Swiss franc has fallen back to 1.03 as I write this, but who knows where we go from here. Switzerland's stock market crashed 12% in 10 minutes, the largest decline since the 1987 worldwide crash. What non-professional currency traders should learn from this action is the all consuming trust in central banks to control every market around the world should be questioned. 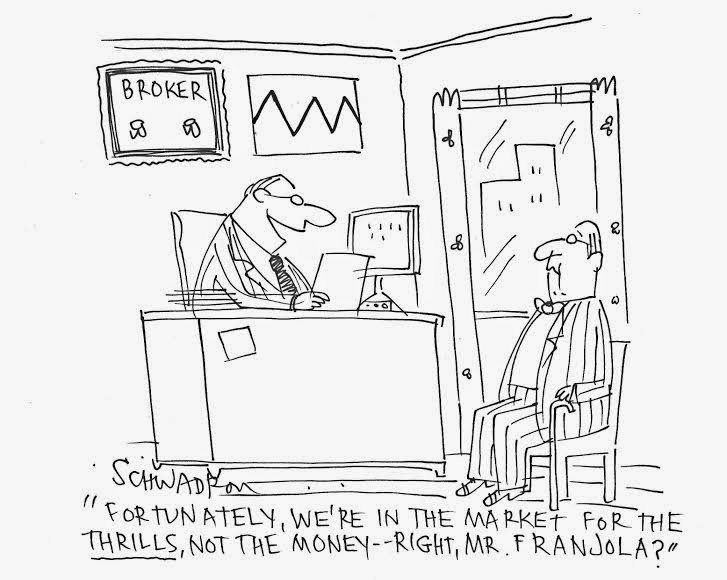 This is more relevant for investors in developed countries who have been implicitly promised central banks will always push their stock portfolios higher. They have been implicitly promised interest rates will always remain low, currency markets will always remain calm and inflation will stay subdued. As we have seen overnight, even the explicit promises can be removed in the blink of an eye. Will this year break the record? What Happened The Last Time The Fed Was "Patient?" The most recent supercharged U.S. stock market rally when engineered by Wall Street's excitement around the word "patient" in the most recent Fed minutes, which replaced "considerable time" describing when they would raise rates. A look at history shows traders should be slightly less ebullient over this choice of words. If this is the trajectory the Fed plans on using in 2015, get ready for turbulence. The dollar is going to strengthen against many currencies (see Japanese yen), and this new world built on easy money will have to finally come to terms with interest rates above 0.0%. With commodity prices in free fall and inflation figures well below the Fed's 2% target, I think all it will take for the Fed to reverse course is a significant plunge in the S&P 500. What happens from there, no one knows, but it certainly appears the Fed has painted itself into a corner. 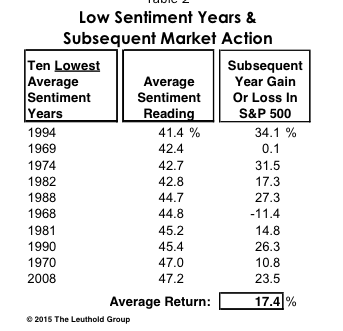 Some great charts on sentiment this week from Meb Faber courtesy of Leuthold's Green Book. 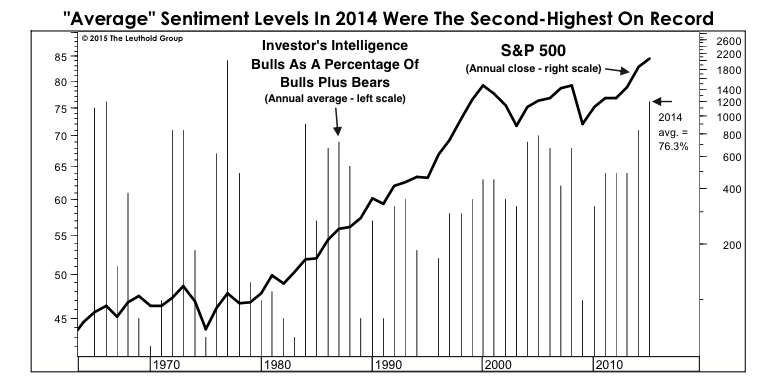 The first chart shows the Investors's Intelligence average annual sentiment toward U.S. stocks. Essentially, a higher reading means there are more people positive on the near term direction of U.S. stocks. Last year was the highest reading in 34 years. The market stayed ridiculously euphoric throughout the entire year, even during the (brief) dips in prices. 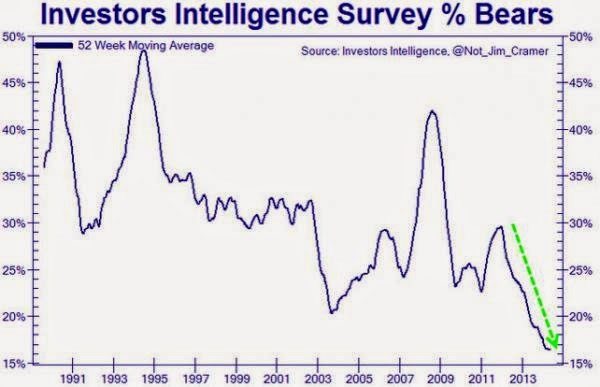 In years past bears would enter the survey when prices dipped thinking the market may have finally reached a cyclical peak. Those bears completely disappeared this year believing every dip was only a better chance to buy more U.S. stocks with leverage if possible. I should note they have all been right so far. 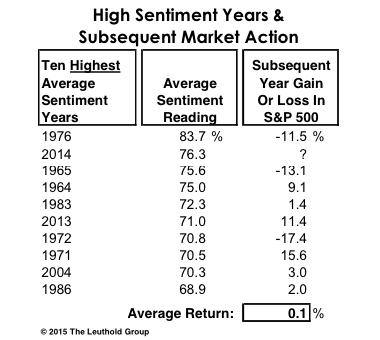 The following chart shows the year after returns for the top 10 highest annual sentiment readings. The average return was 0.1%. 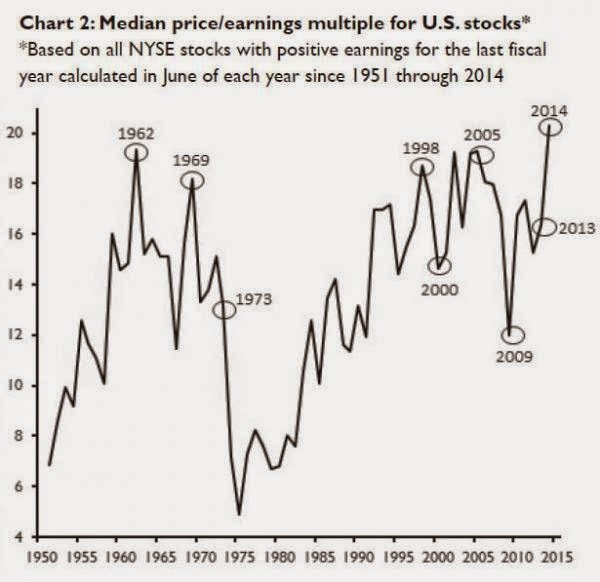 You'll notice that while there were many steep declines, there were also some years with major gains. On the flip side you have the 10 years with the lowest sentiment readings and what transpired the following year. You can see the average returns are now 17.4% with only one down year. It would appear less risky based on historical evidence to enter a market when everyone hates the asset class. This is the reason I heavily weight sentiment when making personal investment decisions. I like to buy fundamentally strong assets after a price decline when sentiment is low. Often times that means I am buying assets which are still falling in price. I cannot, nor will I ever be able to, time a bottom perfectly in any asset class. I'm not a trend follower or market technician, which means I spend a lot of time on the sidelines watching people get rich on paper chasing overpriced assets higher and a lot of time buying things as they're falling in price and people are telling me I'm insane. I consider myself fairly early into my investment life so I'll let you know how this strategy works once it has about 40 years to develop. Fortunately, I'm not blindly guessing. This is the only strategy I'm come across that works over the long run from the thousands of hours I've spent studying the financial markets, successful long term investors and market history. Almost everyone believes they will get out at the top of the current U.S. stock market bubble. I'm betting that most do not. The question is, when the real sell-off finally begins, at what point in the decline will psychology change from "buy the dip" to "uh-oh." As always, I'll be fascinated to watch it take place from the boring bleachers. The Army will grant your release request if you’re insane, but to ask for your release proves that you’re not insane. If X and Y, then Z. But X implies not-Y. That’s a Catch-22. Here’s the Fed’s Catch-22. If the Fed can use extraordinary monetary policy measures to force market risk-taking (the avowed intention of both Zero Interest Rate Policy and Large Scale Asset Purchases) AND the real economy engages in productive risk-taking (small business loan demand, wage increases, business investment for growth, etc. ), THEN we have a self-sustaining and robust economic recovery underway. But the Fed’s extraordinary efforts to force market risk-taking and inflate financial assets discourage productive risk-taking in the real economy, both because the Fed’s easy money is used by corporations for non-productive uses (stock buy-backs, anyone?) and because no one is willing to invest ahead of global growth when no one believes that the leading indicator of that growth - the stock market - means what it used to mean. As U.S. stocks continue to ratchet upward to new levels of overvaluation there has been a larger chorus of reasons to justify the valuations as reasonable. 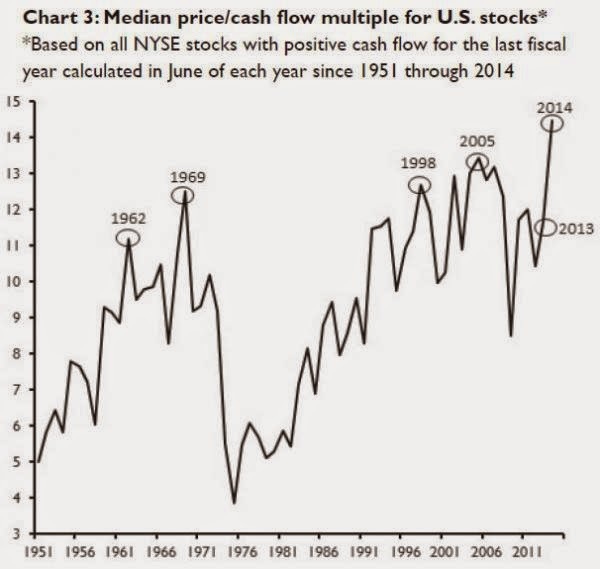 The following chart from DShort averages four of the major valuation metrics, which helps provide a smoothing process to show it is not just one measurement of stock price valuation that is reaching extremes; it is all of them combined. You may look at the chart and say we are well away from the peak of insanity during 2000, and the S&P 500 only fell by 50% following that peak (if that comforts you). What is rarely discussed is the bulk of the overvaluation in the market during that period was concentrated among a small part of the technology sector (the NASDAQ fell by 80%). 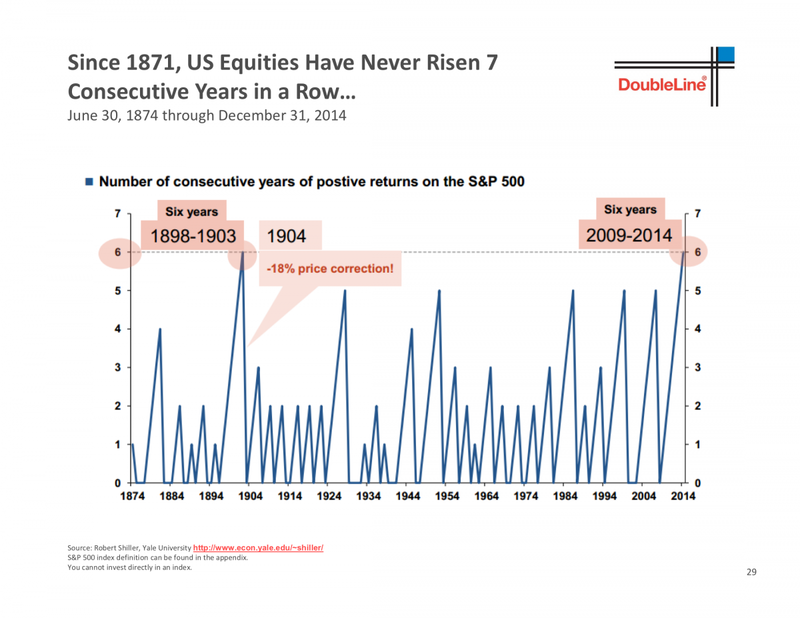 The S&P 500 did not have four consecutive down days in 2014, which has never happened. 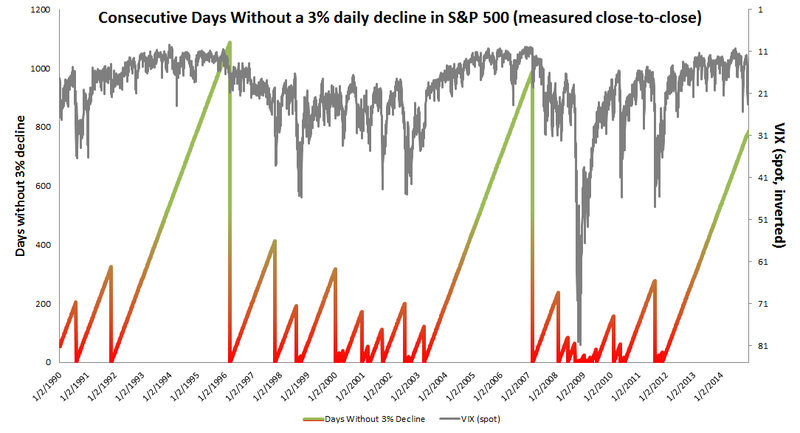 We are approaching 800 straight trading days without a 3% decline. Investors in the market today do not believe a decline is even possible, never mind actually worry about it. The bears have disappeared and there is a larger and larger crowd of bulls that spend their time now taunting anyone who discusses the possibility of a market downturn. This time around the entire market is in a bubble, not just a select sector, and every sentiment indicator has been shattered over the past 18 months with euphoria. None of this means U.S. stocks will turn down tomorrow, but when it begins I anticipate the level of fear and panic being equally as strong as the euphoria we are experiencing today.